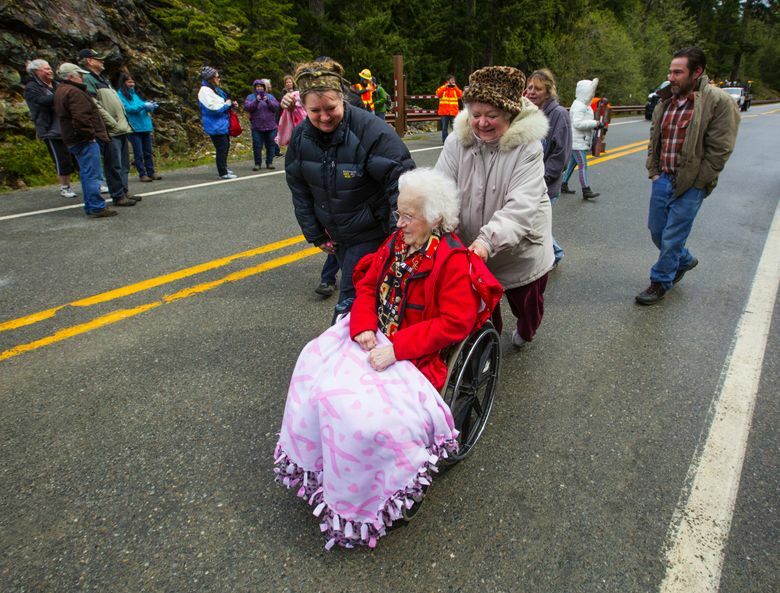 Since the 1970s, Tootsie Clark, now 95, has raced up the North Cascades Highway to share her famous cinnamon rolls and be the first in line when the highway reopened after winter snow was cleared away. This year could be her last. 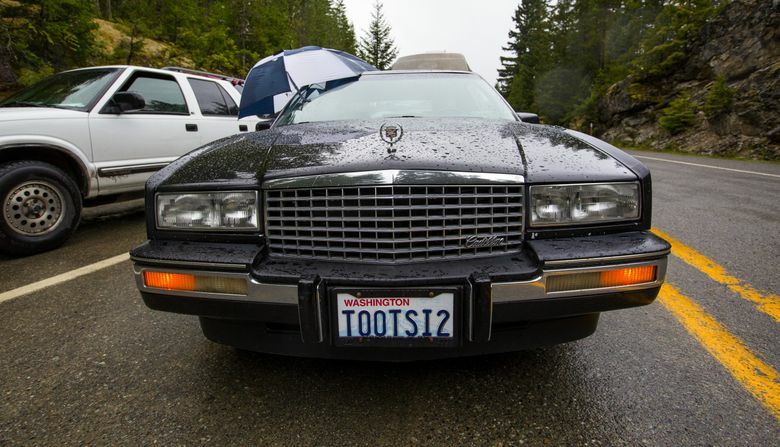 Derrick Boyer leaned down into the passenger window of the 1988 Cadillac El Dorado to shake the hand of the woman who started the sweetest of highway traditions. 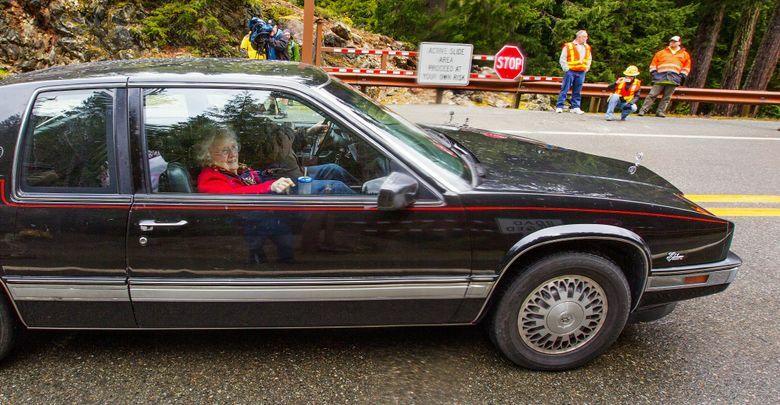 He then leaned into the car to have his photo taken with the 95-year-old Tootsie Clark, who for decades has made the reopening of the North Cascades Highway into a flavorful event with her spunky disposition and boxes of homemade cinnamon rolls. 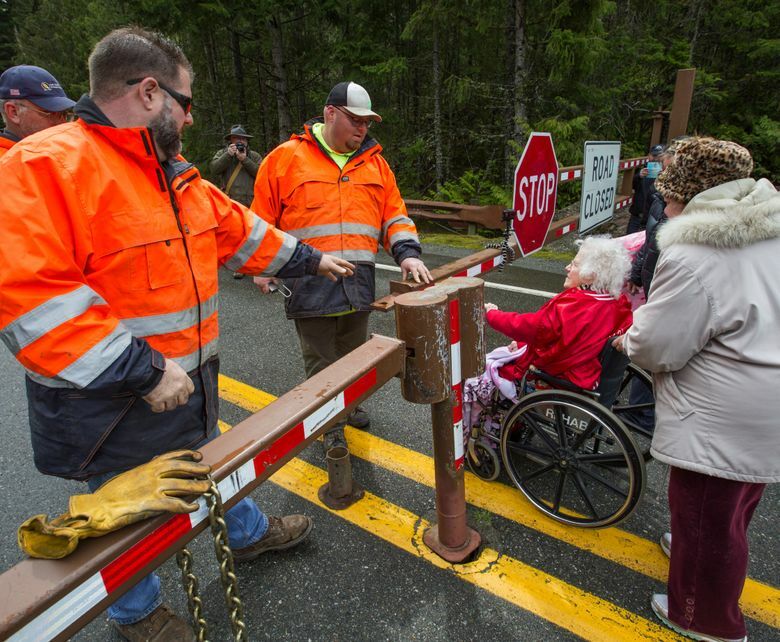 For decades, Clark, whose family has long owned a Marblemount, Skagit County, restaurant and resort, has made it her mission to be the first in line to drive through the mountain passes once the highway was reopened to traffic. 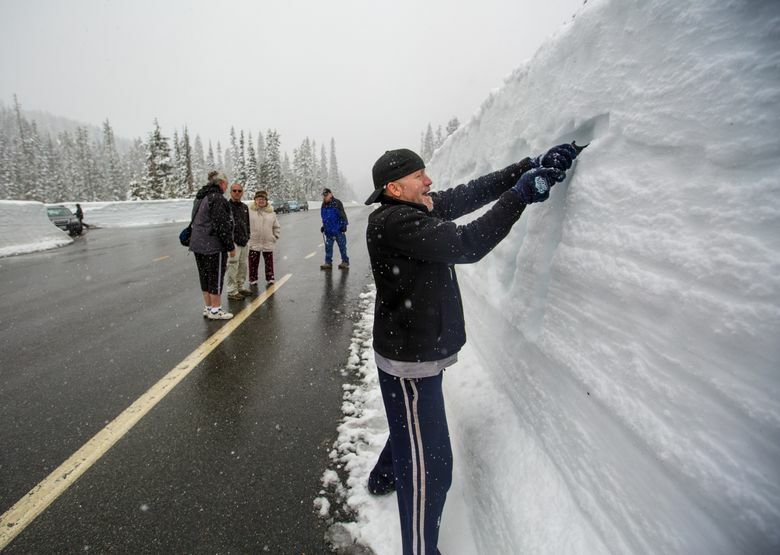 Each year, the highway is closed for winter due to heavy snow along the 34-mile pass with an elevation that rises to 5,447 feet. When it reopens in spring, it’s reason for business owners and travelers to celebrate. Clark does her part by bringing dozens of cinnamon rolls and hot coffee to hand out to travelers waiting for the state Department of Transportation (DOT) to swing open the highway gates. 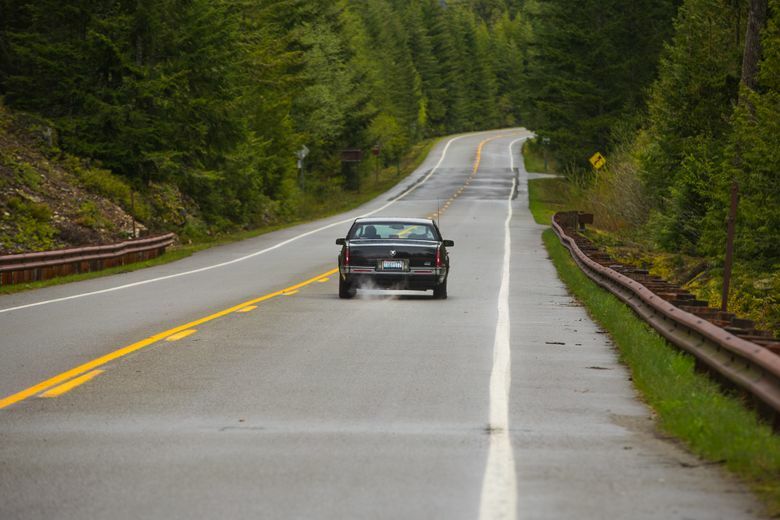 Her son, Don Clark, said giving out cinnamon rolls was her way to draw attention to the highway reopening and to the Marblemount community, which depends on the tourists who travel the scenic roadway. She cooked up quite a tradition. 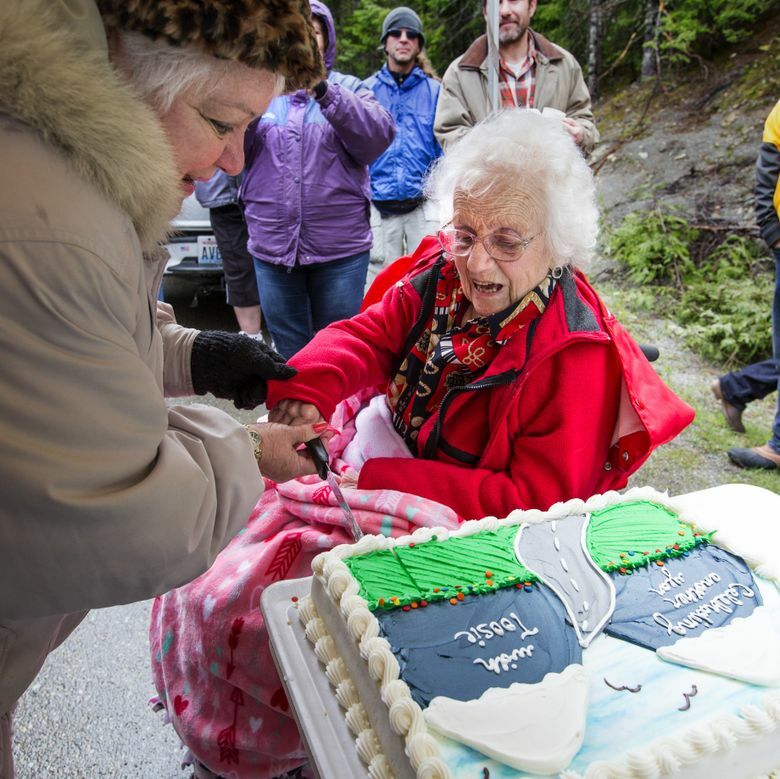 “I don’t think any other [highway] pass that opens and closes is celebrated in quite the same way. It’s unique,” Don said. 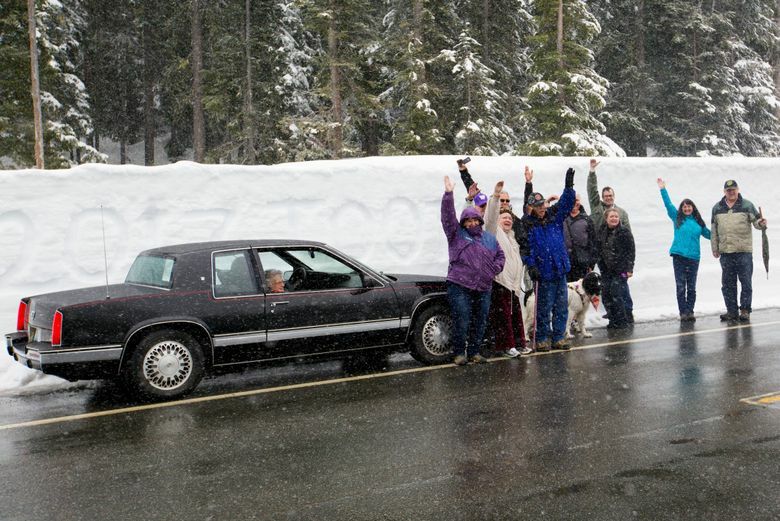 Never mind the biting wind, the frigid temperatures or the forecast for snow, dozens of cars queued behind Clark’s Cadillac to join in on Tuesday’s celebration. 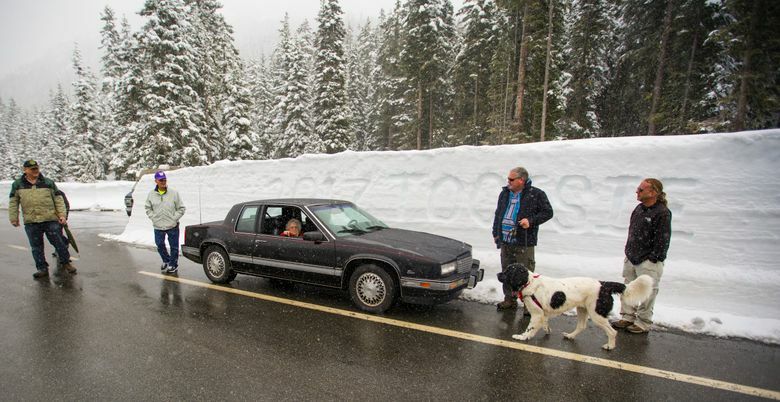 Jess Brown arrived at 6:15 a.m. from Anacortes to save a spot in line for Clark. After 10 years of friendship with Clark’s family, it was his way to contribute. “She just beams,” Brown said. At times, it felt like a birthday party, or family reunion. From beneath a bundle of blankets, Clark chatted with people from Ocean Shores to Everett and Anacortes. Family members passed out cinnamon rolls and mugs of coffee. They cut a cake for her. A woman she’d never met brought Clark a box of chocolates complete with a pink bow. Family, friends and strangers munched on Clark’s famous rolls, drizzled with whiskey sauce. Clark’s arthritic hands don’t allow her to make the rolls anymore, but Don said they still make them to her specifications at her restaurant, The Eatery. Tuesday’s celebration came with a tinge of sadness. Clark is slowing down, her health in decline, Don said. An era is coming to an end. “As a family, we’re billing this as the last event,” Don said. “It’s a fragile time in life. Even if her heart’s in it, I don’t think her body will allow her to do it” another year. The family is in the process of selling Clark’s resort (once named Clark’s Cabins and then renamed the Skagit River Resort) and restaurant, which are being renovated. Resort superintendent Kevin Salter said Clark’s famous rolls would still be served at the restaurant. At 11 a.m., a caravan of DOT road-crew vehicles arrived at the gate. Family members rolled Clark’s wheelchair to the gate and she held out her arms as they pushed. “Go, Tootsie,” yelled someone in the gathered crowd. “Beautiful, beautiful,” said a DOT worker as the gate swung open. “Another year!” shouted Jurene Brooks, Clark’s granddaughter. A few minutes later, Clark set off for Winthrop, where she planned to eat a hamburger at a local joint named Three-Fingered Jack’s Saloon. She said she was excited to see so many people on her big day. Over the years, “It just grew and everybody grew with it,” Clark said. Evan Bush: 206-464-2253 or ebush@seattletimes.com On Twitter @evanbush.